She wrote a great post yesterday called, “How to Shoot in Manual Mode for Beginners,” which I’ve been wanting to write/share for a few months now but haven’t. After thinking about her post and how tricky it can be for auditory learners to glean information from written posts, I decided to make a video tutorial to go along with Michelle’s manual mode tutorial. With Christmas coming up, I’m sure her tips and this video will be something my fellow DSLR beginning photographers will find VERY helpful! GREAT for shooting in low light settings around the Christmas tree with NO flash. Btw, here are the artistically BORING photos I took during the video, trying to show the difference between shooting in auto with a flash vs. shooting in manual. I’m really quite embarrassed to show them, but I’m a person of my word and I told you I would in the video. :) You can find more photo examples here: Photography Tips for Better Indoor Photos. Awesome! Just finished your tutorial, camera in hand! Thank you thank you!! I have been trying out manual but needed more info to move forward. Yay! Loved this! I sat here with my camera and I was sure that I couldn’t take low light photos with my good camera – Canon 40D but I did! Great little video. I need the visual (and audio) and even though I have taken classes, I think I learned more in 11 minutes. I am pinning this to have it for the future. Aw, that warms my little teacher heart… thank you for taking the time to comment (and for pinning)! Saw this on Pinterest and had a quick question. What kind of camera do you recommend for someone who wants to take better quality pictures (like mostly of the kiddos) but who isn’t anywhere near a professional. We have a pretty nice digital camera but definitely am needing an upgrade and I’m not sure where to even start looking! I’d love some advice if you have any suggestions. (and I’m thinking I might even score a good deal next weekend with all the sales?) THEN I will definitely come back and watch this video again so I can take awesome Christmas pictures this year. :-) Thanks! Hi Tyra! 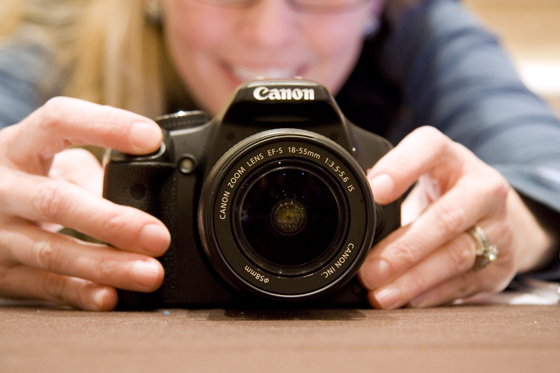 The Canon Rebel is the lowest priced DSLR in the Canon family. I just upgraded from an older one and love the newest model (T3i)! The older models are just as good, but less bells and whistles (moveable LCD screen for odd angle shots and video). The T2i is very comparable and $100 less. Lots of people like Nikon, but at the lower level DSLR the sharpness of photo is better with Canon (which matters only really if you plan to use it for something like selling stock photography – our family business). Before the Rebel, I had a Canon Powershot (point and shoot). It was a nice little camera! One of my good friends has a Fuji DSLR that was less expensive than a Rebel and takes nice family pictures, but doesn’t have interchangeable lenses. She gets nice shots with it, but have heard her say she’d like to move up to a Rebel for more options with lenses in the future. Thanks so much for replying! I’ve had a couple others tell me the Canon Rebel is good too so I’m thinking that’s what I’ll try to go with. I did notice when looking them up online that there’s also a T3 available now which is a little cheaper, maybe more of a beginner DSLR? I’m just wondering if it takes good pictures too or if I should go ahead and get one of the other models you mentioned? I really just want something that can take some good shots of the kids in day to day stuff and then maybe some family portraits too. It said it comes with a lens so I’m thinking they’re still interchangeable on that model (altho it didn’t specifically say so) even though it’s less expensive. Anyway, I’m thinking any of them will probably take good pictures, right? :) Thanks again for your help! I purchased the Sony Nex-5 about 7 months ago, and it takes the most amazing photos I have ever seen. It’s one of the smallest/compact DSLR cameras out there. It fits right in my purse. It’s also sold as just the body, so you can buy whichever lenses you want. I found a great deal for mine on eBay. The shots that it takes in the dark/low light are wonderful; I very rarely have to use the flash. It also does panorama, 3D, action, macro, 1080p video, etc. I’m not a professional photographer, but photography is my greatest hobby. I use it for anything from landscapes to engagement photos. I would highly suggest this type of camera. If you want one that is slightly less expensive, go with the Nex-3. It does 720p for video, but I’m not sure on all the rest of the specs. I have been taking pictures pretty decently for years…but I steer clear of indoors when all possible..and now for my anniversary i got the camera I have been wanting… But it is ver intimidating to me… I feel like i need to learn so much….but i don’t want to leave, taking good pictures, in the past until I catch up with my new camera… So I am ultra worked up about it,lol. I don’t want to take a bunch of junky photos just because i got a new crazy better camera,lol. Thus tutorial is great…any chance there are more? Thank you for passing on the bees comparison…that alone i will be chewing on all day. Here’s to lots of great pictures with your new camera! All I can say is WOW! I have wanted to get a DSLR camera for years, and now that I have a 7 month old, all I want to do is capture beautiful pictures of her. I was finally blessed with a new camera and even got a 35mm lens, but my pictures were not turning out very well. I have searched for videos to help me, and none have compared to what I have just learned. Although I have a Nikon, this has helped me in sooooo many ways. Within 2 hours, I have taken 300 pictures and for the first time, I will have a hard time chosing what to print!!! I thought I would have to use my flash all winter because its too cold to take her outside constantly. But now, I know our first Thanksgiving and Christmas pictures will look great. Who knew I could feel confident in low light settings. This was such a blessing and could not have come at a better time! Thank you so much for doing this. Oh goodness, THANK YOU. This was very helpful for me. I’m finally turning my dial from auto to manual. I didn’t think I was a particularly auditory learner, but I’ve read lots of tutorials about photography but nothing stuck, and it was all so confusing. Thanks for taking the time to make a video. You explained it so well. Yay! Glad you are turning your dial! :) Thanks for the kind comment! You’re so cute! Thank you for this info. It helped me! :) And you’re so sweet! Thanks, Laurie! I stumbled on your blog through pinterest. Just got a new camera, and could use all the helpful hints! This helped me sooo much. I have had my CANON DSLR since March and haven’t been able to figure out Manual mode. One more thing to add to my list of things to be thankful for!! I was very hopeful….but they didn’t turn out as well as I hoped. I was so excited to try out my new knowledge that I forgot to reset my white balance. ( I tried altering it in Lightroom but I’m new at that too. LOL) Then, I used my nifty fifty lense…which probably wasn’t the best choice for the dinner table. It was definitely a learning experience though. Every time I take photos I learn something new! I’m not giving up! Going to keep on trying! THANK YOU!!! Low light pictures have been the bane of my existence! You just spoke exactly to what my challenges were and I feel soooo relieved. Thank you for posting this. I can’t wait to watch more! Thank you! Those little iphone lenses are the perfect gift for my husband!!!! And thanks for the lesson. I’m going to reread now to get all the nuances. I still haven’t sent in my photos to istock. Don’t know why I’m procrastinating! Thank you so much! I can’t wait to try out manual mode on my 7mo old tomorrow! Been trying to figure out no flash/indoors! this is awesome… and you are awesome for posting it! you just made about 10 things about my camera “click” for me… no pun intended. on the bottle of windex that is on my counter… hahaha. and come out so clearly! we have such limited natural light in our home. you are so cute, by the way…. your little video presentation is adorable. you get the sense instantly that you are a very sweet and genuine person. enjoyed watching and am utterly grateful for the help!! things that have never quite sunk in when reading about photography/cameras. Thank you so much! I recently finally changed my camera to manual and have begun figuring things out, but the one thing I was stuck on was that bar! This was a great help. YES! The bar was the issue for me, too! Turns out you have to press the photo-taking button to get the cursor to show up on the bar. Once the camera started communicating with me how I was looking in terms of exposure compensation, I was golden! Hi there! What a great tutorial, especially for a DSLR newbie! I have been shooting with the same camera for a while now & in full manual for many months- I am a bit embarrassed to say that I never knew that I could see if I was properly exposed by watching the exposure level indicator. Mine never moved until I pushed the AE lock button- then it did what it was supposed to do. I certainly had a “duh” moment :) So glad I watched your video. I was picking my shutter speeds, aperture & ISO based on my knowledge & observations of the situations. Most of the time it would work out well- but now I will know for sure. THANK YOU! Wow, I just learned soooo much from your visual tutorial! I have been trying to learn by reading books, and blogs, but I haven’t been able to really understand the manual mode like this. I guess I fell right into your audio/visual population of learners! Thank you so much for your help. Can you post more videos????? I have a canon t2i for the last year, and I don’t feel comfortable in quick situations in anything other than auto mode. I feel my fingers stuttering on the controls, and completely overwhelmed with the choices on the camera, and my mind goes blank on what to do to take a picture that I want. But this video just got me one step closer to getting out of auto mode! :) Thanks again, and keep up the good work! Love this tutorial. I have a Canon Rebel but I bought it used and I have never really figured out how to use it. I am constantly trying new things but then I can’t remember what I did to get that picture. This was great for me to try with camera in hand. Hopefully I’ll be able to take some good photos. Yours are beautiful. Perfect! Found this via Pinterest and plan to read/watch and learn :) Repinned! Thank you for the video, I like it very much. I’ve just bought my first DSRL and I’m really lost. I just watched your video and I loved it! It was very helpful. I just bought my first dsrl camera. I purchased the Canon T2i and I’m going to be ordering the 50mm lens soon. You did a great job explaining and now I’m headed to the other Michelle’s post now! I just got married about a month ago, and next year we are going on our honeymoon to Washington DC on the harley. I have been looking at the T3i Cannon. My friend has a T2i and says she loves it. Is this going to be a great camera for motion and for when we have children. I want a camera that is going to last but take amazing pictures. I love taking pictures. Could you by chance help me out with this decision? Congratulations! I LOVE my T3i and it’s great for what you want. If I remember correctly there isn’t a whole lot of difference between the T2i and T3i (and my husband says there’s a T4i out or coming out soon). Hope that helps! Thank you so much!!!!! I’ve had my DSLR for a little over a year and just haven’t taken the time to learn or even experiment much with the manual settings on it. Your simple and straightforward explanations REALLY helped! I’ve taken my 1st manual pictures with SUCCESS because of your post! Thanks again! Thank you for this tutorial!!! Made tons of sense and gives me a great understanding of how the iso influences the photo! And braceting!!! Cheers! Wow! Great post- great explanations and the visuals of you changing the settings is very helpful! Can’t wait to try this out! Would love other posts on outside in bright sun and outside at night. Thanks for this post! I have only had my dslr for 3 months now and am hooked!thanks for this video explaining manual…I have tried several times to use it on my own…only to get over exposed awful photos…well, I watched your video then got my camera out a canon t4i to practice with you!!! What a difference!!! Can’t wait to try it on real subjects other than my couch cushions!!! This was great! I am a hands on learner and could follow right along with you. What is the name of the 31 day tutorial you mentioned for the lesson on ISO and the worker bees? I would love to read more on that if there is a link you could share. You have it nailed, if only others would listen or at least take the time to search for this stuff then they would know more about taking photos in the dark……………. ” Great Stuff “. Thanks so much! It’s Christmas morning (yes, I meant to study this a lot earlier! :)) and I’m going shoot for some better pics! Your explanations were perfect for even this visual learner to understand. Bless you! Thanks for the BEE tip. I actually understand it now! THANK YOU so, so, so much for this tutorial!! It is the first one that has ever made any sort of sense to me!! I have scoured the internet for any tutorial or guide to taking pictures (specifically in low light) with a DSLR since I got mine and I have been sadly butchering my photos. There are many tutorials out there but they are all presented as if the reader already has a base knowledge and when you’re a beginner, you know nothing!! I did not ever realize that when you turn that dial, they automatically adjust to that middle line you set it on. I thought that line was a premade setting in itself…if that makes any sense. And the worker bees? Genius! I actually feel confident now that I might be able to actually go back to some of those tutorials and have some idea of what they’re talking about! haha Thank you, again! This was a blessing. Thank you! We have the same camera; I got mine for Christmas last year. I’ve been shooting on AV an TV and have a perfect grasp of those. I understood ISO, too, but felt like I was missing something in trying to choose all three for M. I was. I think I might have it, now? Thank you, again! This was an amazing video, the most informative video I’ve seen. Thank you so much for taking the time to make this. Just recently purchased the T3 and I’m just lost :( This video is definitly appreciated. I really want to see your video and how to take pictures in low light. Thank you so much!! this was incredibly helpful! Thank you for this! Very helpful! I have been using my camera for about 2 years and with two little kids I always find myself flipping to auto… this was a great beginners lesson on manual. So glad I found it! Previous post: A $40 SpaFinder Gift Certificate For You! Next post: No Need to Worry.